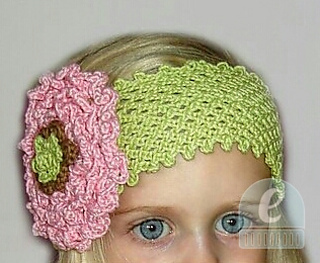 Flower headband is pretty all over the hair or under hair in back. Band is made in cotton with a crochet chain stitch. Worked in the round and detailed with a picot stitch for edging. Flower is crocheted in a contrasted color of band. Find flower photos in pattern on how to create it. Enjoy crocheting it! Yarn Knit Picks Sport; 50 gram, (60% Pima Cotton, 40% Modal; 110 yd): # 25341 Citrine, 1 ball; # 23614 Blush, 1 ball; # 25340 Dandelion, 1 ball. Yarn used is a little amount for each color. There were leftovers I had in my stash. Needles Size B/1 (2.25 mm) crochet hook.